Peter Hickman 2014 Isle of Man TT limited edition giclée fine art print by Billy. This oil on linen canvas painting by Billy of Peter Hickman riding the Paul Shoesmith prepared Superstock Ice Valley Racing by Motorsave Trade BMW S1000RR race bike on his way to becoming the fastest ever newcomer at the famous Isle of Man TT races with an incredible average speed lap of 129.104mph is available in three sizes A4, A3 and A2. The edition is of 129 prints to match Peter Hickman's record breaking TT lap. Each print is signed and numbered by Billy and comes with a Certificate of Authenticity (CoA). Numbers 1,60 and 129 have already gone. Watch the Full HD Time-Lapse Video. Detail below the youtube video. This print has free UK post but I use 'Airsure' or 'International Signed For' for international orders so chose UK or international to purchase the Peter Hickman fine art print. If an international buyer wishes to purchase more than one print then please contact Billy with your requirements and one invoice with one International shipping fee will be sent to you. 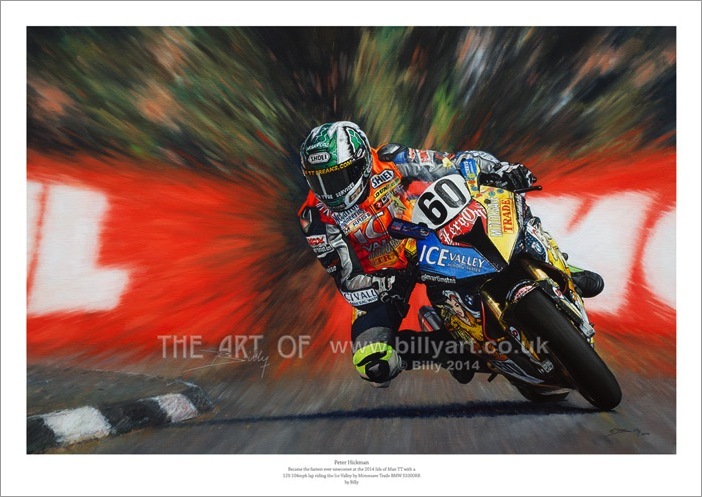 The Art of Billy Watermark does not appear on the Peter Hickman Isle of Man TT Fine Art Print. RUDOLPH'S PULLED A SICKIE AGAIN!.. Download the free Peter Hickman TT 2015 Art of Billy Christmas Card. It is an A4 page that you can simply print and fold in half. 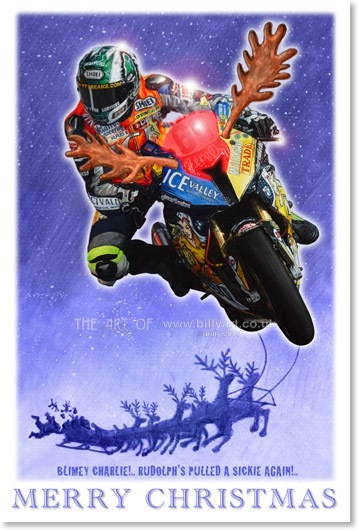 With Hicky doing so well in 2015 on the roads and in BSB with a 131mph lap at the TT, winning at the Ulster Grand Prix and winning the Macau GP among other achievements this 2015 season, It is fitting to use his fastest newcomer art as the basis for a full Christmas Card in 2015.